Wakon Giant Alaskan Malamutes are pure-bred descendants of the pure M'loot type of Malamute that lived with the ancient Inuit peoples in the high Arctic, hundreds of years ago. The Inuit's giant 'sled dogs' were as tall as 35" and weighed over 190lbs. These giant Malamutes were known to be the largest and strongest sled pullers and pack animals. It should be noted that their service did not effect them maintaining the most sweet and loving disposition. They served their beloved Eskimo owners by providing protection from Polar bears and pulling heavy sleds thousands of miles while enduring 70 degree below zero blizzards. These giant Malamutes sometimes stayed in the igloos to care for the little children and ultimately made the difference between life and death for their masters in the most harsh and severe of all habitats. Marlene Ross of Wakon has devoted over 60 years of her life to the preservation of these magnificent, affectionate and hard working giants of the north. While continually living up to a high set of personal values, Marlene has played a key role in saving the Malamutes from extinction that would be caused by breeding habits that are focused on either ignorance or human whimsy. Many of today's dog breeds are of inferior size and quality, not to mention very badly tempered, serving a very sad replica of their original stature and abilities due to human ignorance in the genetic repercussions of improper breeding habits. It is a tragedy that these smaller, poorly tempered Malamutes are being passed off as an ideal standard Alaskan malamute because the Alaskan malamute is supposed to be the biggest of the working sled dogs in the Arctic. 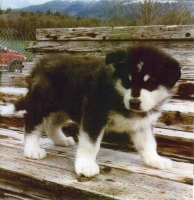 Alaskan malamutes are working dogs in the same context as a draft horse is a working horse. These huge horses (about 1000 lbs. larger than a saddle horse) pulled the covered wagons across America and plowed the fields of the pioneers. Anyone heard to ridicule the owners of draft horses by saying the horse was too big would be considered insane due to the amount of work required by the pioneers to merely survive. The Malamutes were bred to pull the biggest loads over the farthest distance. The Eskimos learned it was better to have one huge dog that could do the work of 3 smaller ones. It was this knowledge that led the Eskimos to practice some of the best breeding practices on earth. They needed such a huge dog to survive and they practiced the best selective breeding program of any place on earth. If the dog did not have the perfect, ideal coat, legs, feet, body, and temperament, he could not survive such a harsh environment. It seems ludicrous that some so-called breeders want to change this supreme, pristine Giant Alaskan Malamute into a tiny, prancing fluff-ball that trips around the show ring and exhibits only the presence of air between the ears instead of a brain! Wakon Giant Alaskan malamutes are never in-bred, resulting in a one-of-a-kind true example of the genetically pure M'loot type of Malamute. This is evidenced of their intelligence, devotion, and loving dispositions typical of their ancestor's Arctic Heritage. Wakon's Giant Alaskan malamutes adore children and are the best of family dogs. They have a playful personality and want nothing more than to please and spend time with you, their pack leader. As such, they rely on you for instructions and discipline. You can count on a Wakon Giant Alaskan malamute to bring so much joy, love and devotion into your life that you will always want to have one to look upon and love each day. These malamutes truly speak to your soul and ARE the Sacred Ones. Remember, it isn't a Wakon Malamute if it doesn't come from Wakon! View some of the dogs in the Gallery!